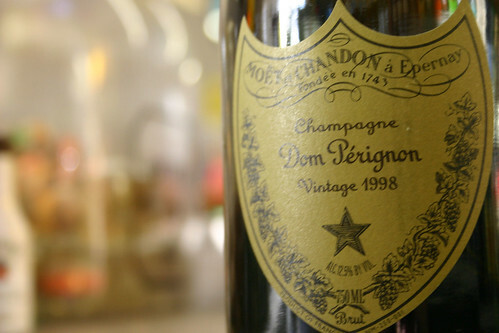 Once upon a time, a monk named Dom Pérignon was making wine and couldn't get rid of the bubbles. After tasting his accidental creation, he exclaimed, "Come quickly! I am drinking the stars!" Or so the story goes. Wired Magazine points out that this fortuitous accident was supposed to have happened exactly 316 years ago today. On Aug 4, 1693, Dom Pérignon invented champagne. Except he didn't. The story is most likely the result of some brilliant marketing campaigns throughout the years, including the "drinking the stars" line, which dates back to an advertisement in the 1800s. In reality, Dom Pérignon was a Benedictine monk who entered the order at the age of 19. He resided at the Abbey of Hautvillers near the town of Épernay (within Champagne, France), where he served as cellarmaster. He was charged by his superiors to get rid of the bubbles in the wine, but was unable to do so. Instead he made great advances in perfecting the method of champagne creation. Champagne undergoes two fermentations. After the first, traditional fermentation and bottling, yeast and a bit of rock sugar are added to the bottle. The bottle, now sealed with a cap, ages for a minimum of 1.5 years. Once the bottle has reached maturity, remuage occurs. During remuage, the bottles are slowly turned almost upside down so that the residual yeast ends up in the neck of the bottle. The bottle necks are then quick-frozen and the cap removed. The pressure in the bottle forces out the ice containing the residue and the bottle is quickly corked to maintain the carbon dioxide. Several houses will add a dosage (sugar syrup) at this point to maintain the level of liquid within the bottle. The bottles are corked and caged, and often aged for a few months to many years before they are released to the market. Back in Dom Pérignon's day, cellars would lose around 20% of their wine to exploding bottles, as the pressure from the bubbles would be just too much. It was Dom Pérignon's advancements that helped bring about the champagne we know today. I love that champagne is such a wonderful beverage, inspiring myths about its creation and songs about its invention. So happy mythical birthday, champagne. You wear 300+ well. What a week! First the redesign, then the Cincinnati.com news. Now I've got one more bit of news, but this one requires YOUR help. A lot of your help. You don't have to donate anything except about a minute of your time to click on something safe. I think you'll get a chuckle out of the whole thing too. Murphy-Goode Winery is offering a 6-month, $60,000 position to someone who wants to promote the winery via social media. They'll even provide you with a rent-free home in Healdsburg. Seeing as how I'm a wine blogger and a social media consultant, it seems amazingly up my alley. I want this job. Really bad. In order to get this job, I had to create a 1-minute video. I thought about embedding it below, but really, I want to drive you to the site to vote. You get a screen cap instead. So many people seemed to just sit and talk about wine. I think wine is part of the job, but understanding social media and marketing is more important. So I tried to tell a story, and I used the Wizard of Oz to do it. Of course, it's also an excuse to dress up like Dorothy. WinemeDineme readers will notice a guest appearance by Julie as the wonderful Glinda the Goode Wine Witch. The video was shot at Harmony Hill, so my HUGE thanks goes out to Bill, Patti, & Evan for letting us traipse through the vines and borrow their dog. Kevin, his brother Steve, and Steve's girlfriend Sarah round out the cast. Filming was done by recent foodie blogger, Bryan. I created an accompanying web site at http://www.rainbowgoode.com. makes me laugh. Dogs are fun to work with ..
On the RainbowGoode site, you can view the various ways I'm trying to market the video, trying to drive votes. I am using every bit of social media I think is relevant – from my LinkedIn groups to this blog, from Facebook to Twitter. I picked up some Google AdWords and grabbed some bit.ly URLs. I'm amazed at the things that were available still. I'm also not discounting traditional media, sending press releases to everyone I can think of. Want one? I'd love to make the Top 50 folks, and hopefully, the Top 10. At the very least, maybe I'll land a social media job of some sort from all this effort. But in order to do any of that, I need your votes. The contest ends June 19, so vote soon, vote often, and tell your friends! According to this article in Decanter, the International Riesling Foundation has proposed that a "taste scale" appear on every bottle of Riesling. This is to help consumers identify whether the wine is sweet, off-dry, dry, and so forth. Of course, you can tell now – or at least get a general idea – by identifying whether a Riesling is a Kabinett, Spatlese, or Auslese (see my definitions in this post). There is a lot on a German wine label – type, regions, and percentages of residual sugar. This is part of a move, I believe, to make German wine labels more approachable. Last year, we were quite taken with the inexpensive Clean Slate Riesling. It was the first German bottle I’d encountered with an approachable "graphic" label. It’s one of the reasons we bought it, as we gave several bottles to our non-wine-drinking friends. What do you think of the idea of a tasting scale added to bottles of Riesling? This isn’t wine related, per se, but I think we can loosely tie it to food, and definitely tie it to Earth Day on Saturday. Have you noticed (or purchased) an eco-friendly shopping bag from your local grocery store? I know we’ve purchased some from both Kroger & Remke’s. We even bought holiday themed ones at Christmas and wrapped our gifts in them. Of course, although Kevin & I love the idea of these bags, it doesn’t mean we’re not constantly forgetting them either at home or in the car. Kroger is launching a "green" initiative online. You can design your own reusable shopping bag in a new contest. If your bag design wins based on online votes, you could win a $500 gift certificate to Kroger. In addition, if you submit your Kroger plus card number when you submit your design, you’ll receive a free reusable bag the next time you visit a store. Find some free time today and design a bag! The more bag designs the better – and happy Earth Day this weekend! One of the awesome things about Twitter is that it’s a great link-sharing tool. Kevin, from Strategic Public Relations, found this awesome tidbit and immediately shared it on Twitter. Now I’m bringing it to you. 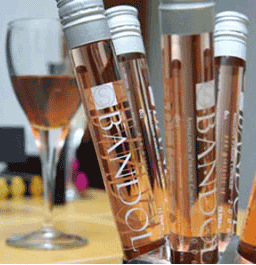 In Paris, you can now sample wine as you might sample perfume. In fact, the packaging is eerily similar. The trend of letting a consumer try-before-they-buy is called Tryvertising (the Apple Store is a giant example of this), and why shouldn’t it be applied to wine? In spirit, it’s no different than attending a free tasting in a wine shop. I’ve also read of other wine shops where you can purchase samples from fancy machines, which is a great way to try that wine you could never afford to purchase. These tube-shaped bottles, because they factor in the look and feel of packaging, take the concept to a whole new level. Pape and other classic wines can be purchased in 6cl or 10cl sizes. retail sales, the products are available exclusively at Colette in Paris this month. I rather like this as something I could take home with me, try it when I want, and return later to purchase a bottle. If I were a large conglomerate, such as Constellation Group, I’d jump on this to market many of my wines, across wineries, at one time.